The following will make 3 loaves. Note: I recommend using a digital scale for weighing your ingredients. It is far more accurate than volume measures and makes for easier scaling of the recipe. But I’ve noted ingredients by both weight and volume. Mix all the ingredients together and then let sit for 12 hours. It will have doubled in size and be bubbly. You know your preferment is ready to use when a small amount dropped into a bowl of water rises to the top. 1. Combine your preferment with the above ingredients. The dough will be mushy and stick to your hands. I find mixing it with a big spoon or wetting my hands first helps. 2. Now let the dough rest for 1/2 hour. 3. After letting it rest, we will begin “kneading.” Wet one hand, and reaching down the inside the side of the bowl, grab a piece of the dough from underneath and pull up, stretch and push back down onto the top. Do this all the way around the dough (about 8-10 times). 5. You will start to feel and see the gluten developing. 6. Now it’s time for the bulk rise. Cover the dough loosely with plastic wrap. If you plan to bake with it that day, let it rise until about 1.5 times it’s original size. About 2-3 hours time. Or stick it in the fridge overnight to do a bulk rise. I find that creates a much better flavor. 7. After it’s finished its bulk rise, turn dough out onto lightly floured work surface and cut into three equal pieces. 8. Take each piece, and flatten/stretch it into a circle. 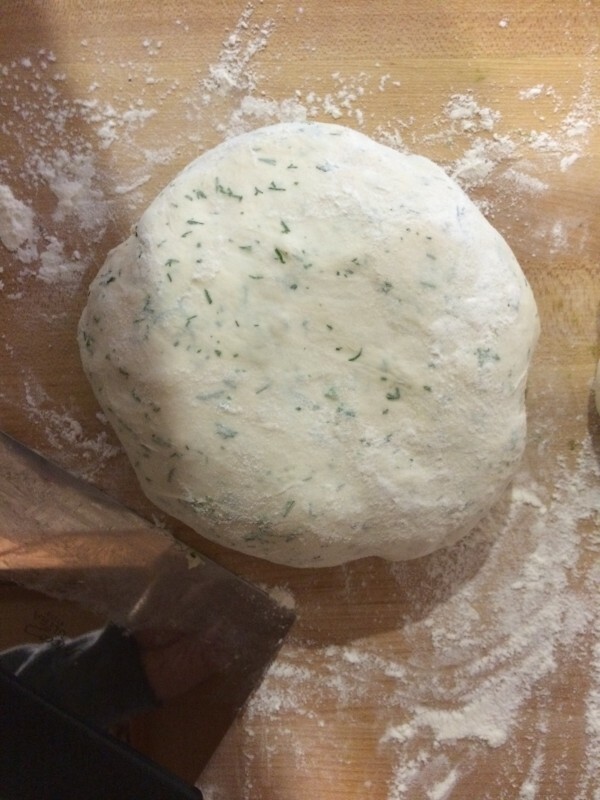 Feel free to let the dough rest for a bit (10-15 minutes) and “relax” to prevent it from springing right back after stretching into a circle. Now fold in the left side, then right side, then roll into a log. 9. Place the bread, log seam side down, into a pre-oiled loaf pan. 10. Repeat for the two other pieces of dough. 11. Now for the “proofing” and final rise. Loosely cover the loaf pans with a cloth towel and let the loaves rise until 1.5 times their original size. About 4 hours. Or you can stick it in the fridge, loosely covered in plastic wrap, for up to 24 hours. If you do put in the fridge, bring it to room temperature before baking. 12. 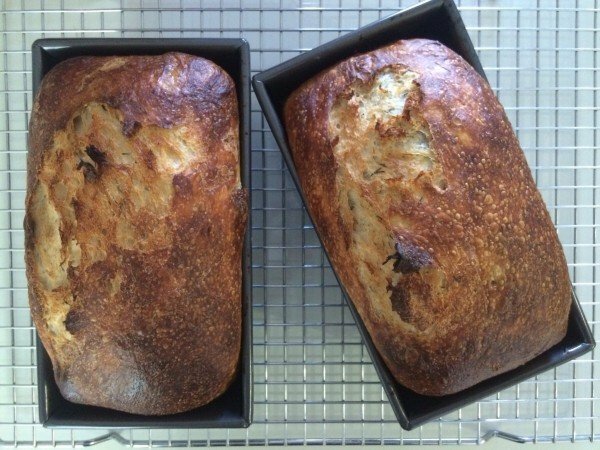 You know the bread is done proofing and is ready to bake when you make a small indentation with your finger and the dough does not immediately spring back. 13. Preheat oven to 475 degrees F. Give it a good 30-45 minute to make sure it is nice and evenly heated. 14. Brush tops of loaves with and egg/buttermilk wash mixture. Cover the loaf pans with foil that’s been tented so as to leave room for the bread to rise when it bakes. 15. Bake for 20 minutes covered and then 20 minutes uncovered until a nice dark brown.